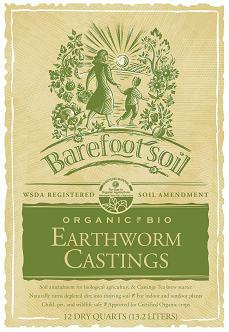 Our Barefoot Soil Earthworm Castings add active microbial life to your soil while slowly releasing valuable trace minerals and important plant growth enhancers. Being high in available nitrogen, phosphorus, calcium, and many other minerals, our Barefoot Soil Earthworm Castings is a perfect Year Round Organic Fertilizer. Worm castings are a rich, all-natural source of organic matter with lots of nutrients and moisture-holding capabilities. 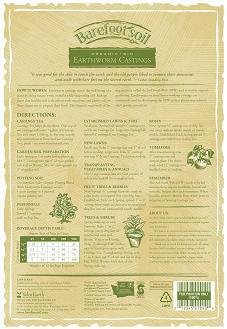 Earthworm castings are known to have an extraordinary effect on plant life. Castings improve the soil structure and increase fertility making them the most enriching soil conditioner available. Barefoot Soil has attained the highest attainable rating of EXCELLENT from an independent testing laboratory. A WSDA Organic Food Program Registered Material, the soil contains 60% worm castings 40% worm compost that has been sifted into a black nutrient-rich humus. The soil is odor free and will not burn. The high species diversity of microorganisms serves as a protector against disease as well as helps to control disease. In addition, the microorganisms break down soil nutrients making them readily available to plant root hairs. Castings also stabilize soil aggregates to enhance water-holding ability. They are high in nitrogen, phosphorus, potassium, calcium, magnesium, and trace minerals that are available immediately and time released for maximum results. There are special plant growth enhancers as well that are only apparent in worm-worked soil. Studies show plants or seeds demonstrate the following attributes when grown in worm castings: greater plant height, leaf area, root mass, better germination and faster growth. Long-term benefits include improvement of soil and subsequent subsurface water quality. 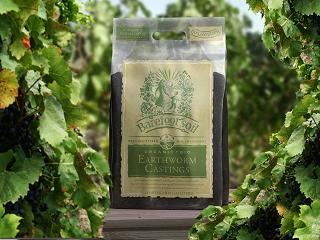 Barefoot Soil Earthworm Castings can be used to make worm tea to spray on soil and plants which multiplies the beneficial effects of the microorganisms.